Well, I also am rooting for you on your month-long missive-mission! 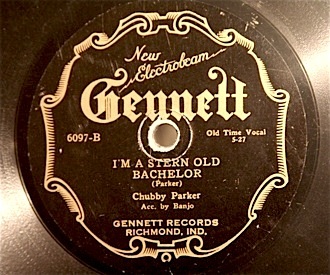 I have a 78 of Chubby Parker as well -- "Chubby Parker and His Little Old Time Banjo" -- which has "I'm a Stern Old Bachelor" on the A side and "Get Away Old Maids Get Away" on the B Side. This was put out on the Conqueror Label. Great set of tunes though unfortunately the condition of the 78 is a little rough. Playable, but rough. I would check the dates on Lomax v. the Carter recording. Also, I think that it's more likely, just in general, for Lomax to have gotten the song from the Carters than vice versa. If anybody living knows, it's Archie Green. I should have an email for him, but I don't. He's in San Francisco, anyway. Any of the living Seegers might know too. I ... I think you might be thinking of Alan Lomax, whereas I'm talking about his father, John Lomax. John's first book, "Cowboy Songs and Other Frontier Ballads," was published in 1910 (nineteen ten!) and was well-known all over the country. I suspect many an enthnomusicologist collected authentic folksongs from genuine hillbillies when, in reality, the hillbillies were sight-reading John Lomax books. Alan Lomax was 17 years old in 1933 (I think this is close) when he started going on field recording trips with Pop Lomax. Right, I was thinking of "the Southern Journeys" which were Alan and John. But I still don't think John Lomax was as much of a source for these musicians at that time. They were pretty worldly and getting stuff from all over. So Lomax maybe, but maybe not so much. A very kind reader in the Netherlands informs me that Derroll Adams recorded Stern Old Bachelor with Ramblin Jack Elliott. I think the album was "Roll On Buddy" on the Topic label. The best place for lyrics, by far, is Mudcat. One thing I love about them is they have detailed discussions and savage arguments about lyrics, which is great because it's inherently a very murky subject, the lyrics to folk songs. After a while, the argument emerges as the more important thing. Of course, the song appears in Alfred Hitchcock's "The Birds". If you get the DVD and watch the "special features," you'll see a songwriter tell a story about being asked to write additional verses for the song. The scene in which it's used is very long and suspenseful, but the song runs out of verses, so they brought the guy in to write more. This has made him a lot of money in royalties over the decades.